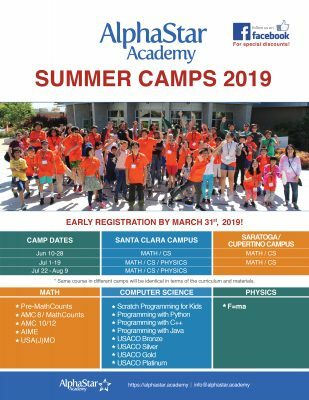 AlphaStar Summer Computer Science Camp is a unique opportunity for interested and talented students to improve their Computer Science skills during summer, where students are guided and trained by expert faculty via utilizing national and international competitions in a fun and challenging environment. It is a day camp which consists of intensive lectures, practice sessions, USACO mock exams and fun activities. 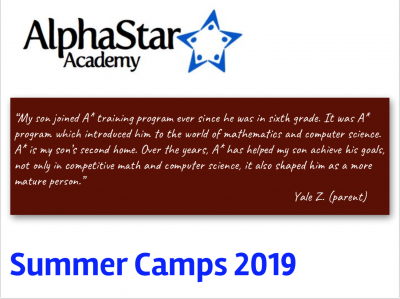 AlphaStar Summer Computer Science Camp is 3-week long with 15 instructional days during weekdays. Computer is not provided. Students have to bring their own laptops. Registered students will receive an email one week in advance the camp regarding the necessary preparations. ** Course material including the account is the same as onsite course. We currently don’t have recorded videos or live lectures. ~~ CURRICULUM UPDATE ~~ AlphaStar Curriculum, previously known as A-Star, is being used since 2008 and continuously improved by our faculty. Starting Summer 2019, we are introducing AlphaStar Curriculum 2.0 with some major updates. The students will be equipped with necessary background in lectures and trained with different types of problems to master various problem solving techniques. The classes are problem solving-based and the curriculum is aligned with USA Computing Olympiad (USACO). Please check USACO Website for more information about USACO. There are five levels at the camp as listed below. For more details and diagnostic exams, please click on the course name below. Programming: These level is for students with very little or no programming background. The aim is to teach fundamentals of programming and to improve problem solving skills. Note that the focus is not the language itself but problem solving in these courses. In this level, there are four different language courses. USACO Bronze: This level is for students who have programming and strong Math background. USACO Silver: This level is for students who compete in USACO Silver division. USACO Gold: This level is for students who compete in USACO Gold division. USACO Platinum: This level is for students who compete in USACO Platinum division. Please see the AlphaStar Computer Science Program page for more details. Please click for diagnostic exams.